Daniel Gray is a Korean-American Adoptee that returned to Korea in 2005 to rediscover his roots. He started writing on his blog, Seoul Eats, as a hobby and then ventured into food related projects. He is a Korean food expert that has worked on and appeared on Bizarre Foods with Andrew Zimmern, Parts Unknown with Anthony Bourdain, the Kimchi Chronicles, Gourmet Diaries of a Foodie, Unravel Travel, and much more. He was the marketing and tour manager of a leading tour company from 2010-2015 and started the first food tour programs in Korea. He is currently the president of Delectable Travels and owns two restaurants: Brew 3.14 and Brew 3.15 in Seoul. In his free time, he writes and photographs food, culture and travel topics. 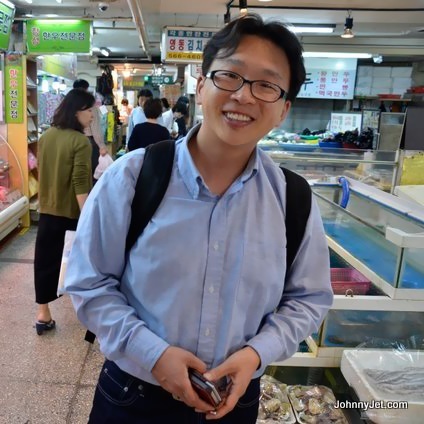 He writes on his blog Seoul Eats and he has an upcoming book on his adoptee experiences. Seoul Eats was started by Daniel Gray, a food-loving American who came to Korea to learn about his roots. It is mainly about food and culture in Korea but also about Daniel's journey in Korea. Want to find the essential eats in Seoul on the go? Download our app to discover the best places to eat in over 275 cities.